This commentary was originally written in the spring of 2002, shortly after the Pharmacia Corporation distributed its annual report for the prior year (2001). Since then, Pharmacia merged with Pfizer Incorporated. Since I still held Pharmacia stock at the time of the merger, I became a stockholder in Pfizer. I therefore decided to update this commentary to include the data shown in Pfizer's annual report for 2002. Many complain about the high cost of prescription drugs, but few understand where the money goes. The 2001 annual report issued by the Pharmacia Corporation — a large international pharmaceutical company — and the 2002 annual report issued by Pfizer Incorporated — an even larger international pharmaceutical company that acquired Pharmacia early in 2003 — explain where the money goes at the wholesale level. Of course, Pfizer sells products other than prescription drugs. However, the sale of prescription drugs (including Viagra, Lipitor, and Zoloft) amounts to 92% of the company's sales. Here are Pharmacia's and Pfizer's own breakdowns, each expense item listed as a percentage of sales. Note that Pfizer's data does not reflect the merger with Pharmacia, which was completed after the close of Pfizer's fiscal year. Totals might not equal 100% because of rounding. General and administrative costs are what we often call overhead. Pharmacia was a very inefficient company, spending more on overhead than on any other item. While the percentage spent by Pfizer on general and administrative costs were relatively less, they still were the largest item. A well run company might spend 20% or less of its revenues on overhead, and we strongly question a government agency that has overhead exceeding 10%. (This is one example of why government should perhaps not operate more like a business.) If Pfizer could reduce its overhead to 20% of revenues, it could reduce the prices of its drugs by 6% without reducing its profits. The AARP urges the public to use generic drugs, which have the same ingredients and effects but are sometimes half the price of brand-name drugs (partially because generics are minimally advertised). The AARP also warns that we should not respond to ads from the drug companies: "Don't let drug company advertising fool you into thinking you need a drug that your doctor hasn't prescribed." Today, much of what a drug company spends on advertising is directed at consumers, who cannot directly buy prescription drugs without a doctor's written order. If Pfizer cut its advertising budget in half (focusing primarily on the doctors who prescribe its products), it could reduce its prices by 3%. Research and development are necessary for creating new drugs that are more effective and have fewer side-effects than the old drugs. However, analyses of the drug industry indicate that most of the costs of research and development are placed onto the wholesale prices of drugs in the United States; this practice is common throughout the industry and not peculiar to Pfizer. Little of those costs appear in the prices of the same drugs sold in other nations. This has even been confirmed in interviews with pharmaceutical executives. Pharmacia's sales in North America (mostly in the U.S.) amounted to 60% of total sales in 2001. The prices of Pharmacia's drugs in North America could have been reduced by 11% if research and development costs were allocated proportionally across all markets, still without affecting profits. Pfizer's 2002 annual report did not show any breakdown of sales by geographical regions; however, a conclusion similar to that made from Pharmacia's 2001 annual report may be valid. Profit is the money left over after expenses are subtracted from income. Profit pays for expanding the business and for rewarding investors who took a risk by buying the company's stock. In recent years, any industrial company with an after-tax profit of 10% of revenues is doing quite well. Unlike Pharmacia, Pfizer's has exceptional profit: 28% of revenues. Pfizer will still fall into the category of "doing quite well" if it reduced the prices of its drugs by 18%. While cutting drug prices in half is an unrealistic dream, there are many things that Pfizer could do to significantly reduce the costs of its drugs. At first, elderly U.S. residents living near our northern border would join bus excursions into Canada to fill prescriptions at Canadian pharmacies. With socialized medicine in Canada, drug prices are rigorously controlled. With no Medicare prescription benefit (and no real, substantive benefit in the near future), senior citizens from Washington state to Maine could afford their necessary drugs only if they bought them in Canada. The costs of the excursions were more than compensated by the savings in drug prices. Retail sales of prescriptions by Canadian pharmacies to U.S. residents have swelled from a trickle to a flood. Now, Canadian pharmacies take orders for U.S. prescriptions over the Internet and via postal mail. Many younger but uninsured U.S. residents have joined the elderly as customers. One drug company now refuses to ship products to any Canadian pharmacy that fills mail-order prescriptions. This is not because Canadian pharmacies do not pay enough; the prices were deemed acceptable when only Canadians were the customers. This is because U.S. customers do not want to pay more than customers in other nations. Rather than reduce prices in the U.S., that company wants to cut off necessary medications to an entire nation. Drug companies have started a publicity campaign, claiming that drugs bought in Canada are unsafe. Many of the drugs sold in Canada are manufactured in the U.S., in the same factories as drugs sold in the U.S. Are we to believe that shipping drugs twice across the border somehow makes them unsafe? Many other drugs sold both in the U.S. and Canada are manufactured in Europe and Asia. How are they safer when shipped directly to the U.S. than shipped through Canada? Canada is a modern, industrialized nation with a health care system that reaches a greater proportion of its inhabitants than does health care in the U.S. In some ways, Canadian regulation of drugs is more restrictive and rigorous than U.S. regulation. The Canadian government would not put its own citizens at risk with unsafe medications, and U.S. residents are at no added risk when buying from a Canadian pharmacy. We now hear from the drug industry that buying drugs through the mail is unsafe. Why then do many employers with health care fringe benefits encourage their employees to use mail-order prescription services? Oh, they mean "through the mail from Canada". Well, that goes back to the previous argument that any drugs bought in Canada are unsafe. Poppycock! In October 2004, a study was released in Canada claiming that the Web sites used by U.S. patients could be hacked by terrorists, creating a severe danger to the health of the U.S. population. The study also tried to paint a picture of risk to Canadians. This study was financed primarily by drug manufacturers and their Pharmaceutical Research and Manufacturers of America trade association. It failed to address any risks posed by the many U.S. pharmacies that have their own Web sites for renewing prescriptions. The real issue is that the drug companies want to protect profit margins that far exceed "doing quite well". They want U.S. consumers to keep paying to support those profits. As drug companies announce embargoes against Canada, the answer seems very simple to me. Canada is a sovereign nation with its own laws. The Canadian government should declare patents on pharmaceuticals null and void for any company that restricts the importation of prescription drugs into that nation. This would be a boon to Canadian drug companies, which would then be free to manufacture generic equivalents. The FDA — created to protect the consumer — has become a mouthpiece for the drug companies. The FDA echoes the dire warnings of those companies about Canadian imports, which is not surprising when you consider how many top FDA officials received fees as consultants to the drug companies. However, the "Health" section of the Los Angeles Times (9 February 2004) contained a front-page article about the problem of bogus drugs in the U.S. Bottles labeled as Zyprexa (used to treat schizophrenia) actually contained aspirin. Salt water was sold in place of injectable drugs needed by cancer and AIDS patients. Low-strength medicines were relabeled as high-strength. Drugs used by a patient with a liver transplant were diluted to 5% of the strength indicated on the label. At least 98,000 prescriptions for chemotherapy drugs were diluted by a single pharmacist to increase his profits. No, these were not prescriptions mail-ordered from Canada by U.S. patients. These were drugs supposedly manufactured in the U.S. and distributed by U.S. wholesalers to U.S. hospitals, doctors, and pharmacies. Instead of slandering Canadian pharmacies (part of a scheme to protect the profits of U.S. drug manufacturers), the FDA needs to direct more attention to our own domestic supply of prescription drugs. In the meantime, we might actually be safer buying prescription drugs from Canada than from our own local drug store. Using the example of one particular drug, compare how the FDA and Health Canada (which has a role with respect to prescription drugs in Canada very similar to the role of the FDA in the U.S.) protect patient safety. 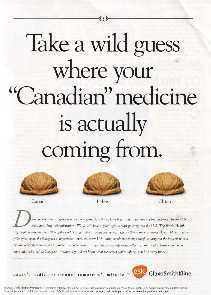 At the insistence of Health Canada, AstraZeneca issued a public advisory on 16 April 2004 that its asthma drug Accolate might cause liver damage. The advisory lists nine symptoms that Canadians taking Accolate should carefully note. AstraZeneca also distributes Accolate in the U.S., where no such alert has been issued. The FDA has no specific warning about Accolate on its Web site. Now who do you trust more to ensure prescription drugs are safe — the FDA or Health Canada? Which agency do you think is more likely to be a lackey for the pharmaceutical industry? MR. SCHIEFFER: New question, Mr. President, to you. We're talking about protecting ourselves from the unexpected, but the flu season is suddenly upon us. Flu kills thousands of people every year. Suddenly we find ourselves with a severe shortage of flu vaccine. How did that happen? PRESIDENT BUSH: Bob, we relied upon a company out of England to provide about half of the flu vaccines for the United States citizen, and it turned out that the vaccine they were producing was contaminated. And so we took the right action and didn't allow contaminated medicine into our country. We're working with Canada to hopefully — that they'll produce a — help us realize the vaccine necessary to make sure our citizens have got flu vaccinations during this upcoming season. Yes, the President suggested (in his convoluted way) that the U.S. might indeed import influenza vaccine from Canada while his administration still insists that prescription drugs imported from Canada are unsafe! VANCOUVER — A Vancouver-based firm won't sell 1.2 million doses of influenza vaccine to the United States after all, announcing Tuesday that it will sell the doses within Canada instead. ID Biomedical is Canada's main supplier of flu vaccine. On Monday, it announced a multibillion-dollar, multi-year deal to export its vaccine Fluviral to the U.S., which has been experiencing a severe shortage this year in the wake of quality problems affecting one of its main suppliers. Dr. Julie Gerberding of the U.S. Centers for Disease Control confirmed that the U.S. would import vaccine from two unlicensed foreign manufacturers whose plants the FDA had inspected in recent weeks. One of them was ID Biomedical's plant in Ste-Foy, Que. The other was a GlaxoSmithKline facility in Germany. ID Biomedical had hoped to kick off the deal by supplying the U.S. market with 1.2 million surplus doses of this year's flu vaccine. But the company now says it won't send doses south of the border until at least the 2005-06 flu season. The Canadian government had convinced it that the surplus doses for this year would be required at home, ID Biomedical said in a statement Tuesday. "The reality of the matter is there is a need in Canada," said Dr. Tony Holler, the company's CEO. The pressure by the Canadian government on ID Biomedical to keep the vaccine in Canada should be no surprise when you consider how virulently the U.S. FDA condemns Canadian pharmaceuticals as dangerous. In the meantime, the GlaxoSmithKline vaccine is still experimental and has not been approved for general use by the FDA. Before someone can receive the GlaxoSmithKline vaccine, he or she must sign a waiver acknowledging the experimental and possibly risky nature of the vaccine, which may prevent any claim for injuries if the vaccine causes harm. In Canada, all available flu vaccine is already approved as safe. No experimental vaccine is in use there. Once again, the Canadian government (home of "unsafe drugs") demonstrates that it has better controls over the safety of pharmaceuticals than does the U.S.
Drug importation is a game where no one wins. And if new laws pass, drugs that have not been approved by the U.S. Food and Drug Administration (FDA) will have a green light to start pouring into the U.S. The World Health Organization estimates that 10% of the world's drug supply is counterfeit, and as high as 60% in some countries. The FDA has said that if Congress opens the floodgates to importation, even the entire U.S. Army would not be big enough to carry out the inspections and take the other steps necessary to protect the public against drugs that are not safe or not effective. You need to learn more about importation bills before Congress. Because if you don't know what medicines you're taking, you lose every time. The ad implies that importing prescription drugs is as risky as a shell game. What the ad does not say is that GlaxoSmithKline itself manufactures prescription drugs in 38 countries around the world, including China. That's right! Many of the prescriptions sold by drug stores in the U.S. were manufactured by GlaxoSmithKline in the very nations that company cites as dangerous sources of imported drugs. The real danger from imported drugs is the threat they represent to drug company profits. WASHINGTON — Testing has turned up possible irregularities in some samples of a blood thinner linked to several deaths and hundreds of life-threatening reactions, a spokeswoman for Baxter Healthcare Corp. said Thursday. The disclosure comes amid mounting questions about the U.S. Food and Drug Administration's oversight of drugs manufactured overseas. Baxter's testing found "trace differences" in some lots of the blood thinner heparin, including quantities in which the active ingredient came from a supplier's plant in China, said Baxter spokeswoman Erin Gardiner. According to a recent congressional report, the chronically underfunded agency [FDA] does not have an accurate count of foreign drug plants that fall under its jurisdiction. Many — such as the plant in China — have never been inspected. Baxter Healthcare bought the active ingredient for its heparin in bulk from another U.S. company — Scientific Protein Laboratories of Waunakee, Wisconsin — which manufactures much of that ingredient in China. While GlaxoSmithKline warns us against buying drugs from Canada because they might be made in China, U.S. pharmaceutical companies are killing Americans with drugs sold in the U.S. but also made in China. The reality is that the drugs sold in Canada and in the U.S. are the same. They are made by the same companies using the same suppliers. The major differences are that (1) Canada controls the prices of prescription drugs and (2) Canada is more vigorous than the U.S. in monitoring the safety of its drugs. Canadian drugs are likely to be more safe than U.S. drugs, not less safe. The drug companies are attempting to solidify their control over the National Institutes of Health (NIH) — a federal agency created to protect the public's health through independent research. After conflicts of interest by NIH scientists were exposed — in which government scientists who were supposed to review the safety and effectiveness of new drugs were actually being paid large consultant fees by the drug companies — new rules were announced to prohibit not only consultant fees but also investments in the drug companies by NIH scientists. According to the Los Angeles Times (21 April 2005), however, the law firm of Arent Fox has filed a lawsuit on behalf of affected NIH scientists. The firm is charging the scientists a discounted fee, which it can well afford: The major clients of Arent Fox are drug companies and the Biotechnology Industry Organization (a pharmaceutical trade association), for which the law firm acts as a lobbyist in Washington.